Home / Events / Events / Exclusive ArtsOne/CAP ‘ePortfolio’ workshop! 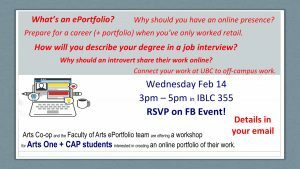 Arts Co-op office and the Faculty of Arts ePortfolio team are offering a workshop for Arts One and CAP students interested in creating an online portfolio of their work. Drawing on examples of professional portfolios in your field, we’ll show you how to collect, curate, and describe your scholarly work for a non-academic audience – and to connect your work at UBC to any co-curricular or off-campus work. In addition to the 45-minute workshop, there will be open office hours for 30 minutes before and after the workshop, for anyone who wants one-on-one feedback or technical support.